Fellow role-players, here are my belated notes for Session 5b.27 of the “Vortex” space opera campaign. Team 2 met on Monday, 30 January 2012, and is using FATE 3e Starblazer Adventures/Mindjammer, Bulldogs, Diaspora, and Limitless Horizons. A band of grifters and near-humans retrieved dangerous samples from a battlefield north of Karachi and the Ghanki undersea station. It stole starship engines from a lunar base and an orbital city and was involved in medical disasters in the Venusian colonies. After finding a dimensionally displaced derelict, the team made inquiries into its cargo amid religious turmoil on Titan…. >>”22 to 24 November 2194 A.D./C.E. or 0 Terran Galactic Era:” Upon returning to Earth, the crew of the Appomattox investigated its cargo of Vatican relics, traded castaways to Ru’ulok contacts, and threw a house party that went awry when agents from Systemes de Recuperation Executif Cie (SRE, or Executive Retrieval Systems Inc.) tried to take control of their ship. Capt. Gabriel Adams stumbles out of the “Gabriel’s Rebellion” (the latest false registry for the space yacht) and rejoins ARTHERR at an estate near Atlanta. The robot tranquilizes the partygoers with gas. Jasmine sends her boyfriend Darsii to carry drunken con artist Richmond Garret back to the ship while she helps search for Hector Chavez in the mansion. ARTHERR uses the Appomattox‘s scanners and finds four life signs in the manor’s basement. Acrobatic Gabriel leads the way across a trapped room with a tilting floor, aided by ARTHERR as a counterweight. Jasmine smells fellow “Synths” (synthetic or genetically engineered humanoids). The trio tracks Hector to a room behind a heavy door. Gabriel tries to lure a Martian Ursoid (“Uplifted” bear) guard away from the door, but Marco Sparks ignores most of his jabs with a broken tequila bottle. Onetime wrestler Jasmine jumps Sparks, as Gabriel and ARTHERR run into a nearby garage. The S.R.E. Ursoid is a worthy match for Jasmine’s tiger strength, so ARTHERR pours some lubricant on the floor. Capt. Adams finds a hovercycle and rams it into the locked door, igniting the oil and crashing into a wall in the next room! Mighty Jasmine’s choke hold renders Marco unconscious, and she follows Gabriel and ARTHERR through the blazing doorway. They confront an android with whirring blade hands and a near-human menacing Hector. Courier Gabriel dodges shots from Glenn Alexandrov’s revolver, while ARTHERR distracts fellow droid Gensu 3k. Intimidating Jasmine knocks Glenn down and disarms the S.R.E. cyborg of his sonic shotgun. Gabriel finds a vibroknife to free Hector from his bonds. Jasmine shoots at Gensu 3k, whom ARTHERR tries to stun and reprogram with old songs. Gabriel stabs at the robot, disabling it. Jasmine and Hector look for a getaway truck, but Capt. Adams steals a rare 1967 Shelby convertible from the garage. Curious ARTHERR partially reactivates Gensu 3k to take back to the Appomattox. Jasmine picks up Hector, who is upset that S.R.E. got the drop on him while planetside. Upon returning to their ship, the members of “MarSoupAiL” (shell company Mars Soup Aid Lenders Ltd.) find that the two women who fought with Gabriel have escaped! Darsii explains that he saw Nero Bartholomew, chef and onetime owner of the “Fortune’s Fool,” and reptilian Synth deckhand Averki “Deep Dish” Dyashenko leaving with retrieval agents Jeanie Belveaux and Lisa Panko. Richmond and Gabriel are furious with the deserters, but ARTHERR has brought Gensu 3k, and former spy Hector notes that he wasn’t aboard at the time and that the adventuring party has multiple enemies near Earth. The Appomattox takes off, with Gabriel considering headings in search of fortune and glory. He and Hector send messages to their contacts for potential gigs. ARTHERR prepares to reprogram the newest crew member, and Darsii reminds Jasmine of her offer to help rescue Synth Liberation Front supporters from the United Ecumenical Movement’s temple on Mars’ moon Phobos…. Meanwhile, about 40 parsecs from the Sol system, the crew of the “Blackbird” lies low after shooting up a shady establishment run by the Encegulans. The explorers and would-be diplomats continue their searches for a missing Kharvamid agent and a way to use a Precursor jump gate, but they encounter a Zurmiz Krott at Oasis Station…. I hope that the various scenarios that other Game Masters run while we’re taking a break from my regular “Vortex” and Pathfinder/Skype: “the Uncommon Companions” games go well! We’ll have to look at alternate locations as Josh & Sara and Janice and I settle in after our moves. Posted on February 23, 2012 by GeneD5Posted in Games, Speculative Fiction, VortexTagged appomattox, bulldogs, cyberpunk, fate, rpg, sfrpg, starblazer adventures, team 2. Fellow role-players, here are my notes for Session 5b.26 of the “Vortex” space opera campaign. Team 2 met on Monday, 16 January 2012, and is using FATE 3e Starblazer Adventures/Mindjammer, Bulldogs, Diaspora, and Limitless Horizons. >>”14 to 21 November 2194 A.D./C.E. or 0 Terran Galactic Era:” After rescuing some castaways and reneging on their deal to deliver items from the Vatican to the arachnid Nolath near Epsilon Eridani, the Terrans headed back home. Capt. Gabriel Adams wants to get paid for the hot cargo and to keep a few souvenirs. ARTHERR recommends hiding it somewhere in deep space “for the good of all mankind.” Jasmine would prefer to return the artifacts to the United Ecumenical Movement (U.E.M.). Richmond Garrett, who accepted the relics from fixer “Ramon Sanchez” [Josh H./N.P.C.] months ago, is initially disappointed at not being able to complete his mission. The con man is reluctant, however, to return to Earth with the items. Hector Chavez recommends inquiring with the United Earth Authority, but he is outvoted. The crew of the Appomattox ultimately agrees to leave the containers in interstellar space, where it’s very unlikely that anyone else would find them. ARTHERR makes a note of their position. Pilot Gabriel switches the yacht’s false registry from the “Heaven’s Gate” to the “Gabriel’s Rebellion” as it reenters the Sol system. ARTHERR suggests checking at the Vatican Museums to reveal that some items are forgeries. The Vimeco robot believes that this would increase the value of the original items and flush out potential buyers. Onetime wrestler Jasmine sends a message to her boyfriend Darsii on Mars. Missing the comforts of home, Richmond goes to the southeastern coast of North America to look at mansions for sale. Former spy Hector goes to meet his handler Max. As his distrust of nonhumans hardens into intolerance, Capt. Adams talks with Yiushef of Geruno, the Cestolar (badger-like alien) who attacked him in the wreck of the Razorfeather near Epsilon Eridani. Yiushef explains that the Olvar (mammal-like arboreal alien) crew had tried to carry out its trade mission to the Gustrall (antlered, orange-furred, raptor-like warriors). He still suspects one of his fellow survivors, including Maj. Mohing Lankel, Lt. Doina Claren, and Mr. Kares Mussur, of being a saboteur. ARTHERR uses tranquilizer gas to keep them from tampering again with the ship’s systems. At a trattoria in Rome, Gabriel meets fixer Lillian Morrissey. She confirms that a team from Systemes de Recuperation Executif Cie (SRE, or Executive Retrieval Systems Inc.) is among those looking for his crew. Central Asian despot Col. Raj, disgraced Venusian oligarch Orion Stefanov, and angry Ru’ulok (heavy-gravity reptilian alien) ship captains are among the enemies of “MarSoupAiL” (shell company Mars Soup Aid Lenders Ltd.). Using “Dr. Garrett’s” credentials as onetime surgeon general of Venus, ARTHERR schedules an appointment with glory-seeking professor Dr. Vlad Perkovic for a private museum tour. Capt. Adams takes Jasmine to the Martian outback. They find Darsii on the run from rival factions of the Synth Liberation Front. On the way back to Earth, Darsii asks Jasmine for help breaking out comrades from the U.E.M. chapels on Phobos. The Appomattox picks up Richmond and goes to Rome to meet with Dr. Perkovic at the Vatican. Gabriel, Jasmine, and Richmond find the professor talking to news reporters about his recent archaeological digs. They discreetly usher him away from them to a gallery where they “just happen to notice” that certain works of art are replicas. The grifters offer to let Dr. Perkovic take sole credit for uncovering the conspiracy in return for keeping them out of the publicity. He readily agrees and leaves to contact his agent. To celebrate their scheme, MarSoupAiL returns to one of the estates that Richmond looked at near Atlanta. Once they verify that the owners aren’t home, the rogues invite some friends over for a house party. Lillian tells underworld courier Gabriel that Col. Raj is looking to hire his team to retrieve family members from U.E.A. custody. Hector watches the Olvar and Cestolar prisoners before being dispatched to scan the mansion for surveillance devices. ARTHERR helps crewmates Nero Bartholomew and Averki “Deep Dish” Dyashenko set up a toga party per Richmond’s demands. Jasmine and Darsii wander off to explore the Terran wilderness. Capt. Adams invites Ru’ulok pirates Rabak Porset and Gorvek Beezo, who arrive with vodka fresh from their dealings with the Slavic Commonwealth. Unbeknownst to his companions, Gabriel privately trades the Olvar and Cestolar castaways in return for passcodes to the Mozarik system in Ru’ulok space. He also asks about downgrading the Appomattox‘s missiles and boosting its Transit drive to a speed of 1 parsec per Terran day. Rabak and Gorvek order robotic henchmen to bring Yiushef, Maj. Lankel, Lt. Claren, and Mr. Mussur to their shuttle. In the meantime, some of Nero’s lady friends arrive as Richmond gets drunk and brandishes the blunderbuss he took from the Dawn’s Retreat. Gabriel takes two of the women to his ship’s cockpit. ARTHERR scans them and confirms that they are human rather than gynoids. However, the probe droid soon identifies them as Jeanie Belveaux and Lisa Panko, members of an S.R.E. retrieval team! Hector finds that he is being jammed from somewhere in the mansion, while Jasmine and Darsii notice the Appomattox taking off. Intoxicated Richmond jumps into a swimming pool, missing Deep Dish. Shrugging off the effects of a gas attack, Gabriel fights off Belveaux and Panko and narrowly evades a pursuing S.R.E. craft. With help from ARTHERR, the pilot manages to land the Appomattox in the manor’s tennis courts, and he locks the two repossession agents in a cabin. The partiers try to figure out what’s going on, and Gabriel still hopes to impress the two women for their interplanetary casino. ARTHERR finds Hector, while Deep Dish carries Richmond out of the pool. As they return from the woods, Darsii reminds Jasmine that he needs MarSoupAiL’s help on Phobos. The crew of the Appomattox gathers to plot its next moves to get paid and again avoid local authorities…. Posted on January 29, 2012 by GeneD5Posted in Games, Speculative Fiction, VortexTagged appomattox, bulldogs, fate, sfrpg, starblazer adventures, team 2. Fellow role-players, here are my notes for Session 5b.25 of the “Vortex” space opera campaign. Team 2 met on Monday, 19 December 2011, and is using FATE 3e Starblazer Adventures/Mindjammer, Bulldogs, Diaspora, and Limitless Horizons. >>”8 to 14 November 2194 A.D./C.E. or 0 Terran Galactic Era:” After side trips to colonies on Venus and Saturn, the Appomattox delivered items from the Vatican museums to Epsilon Eridani, about 10.5 light-years (ly) from the Sol system. There, it met the Kazador, a trade vessel of the spider-like Nolath. Hector Chavez briefs Jasmine on internal and external security precautions. Gunner Jasmine also checks on the yacht‘s missiles. Capt. Gabriel Adams, who distrusts the Nolath, scans for other ships in the area but finds none. Engineer Hector customizes a missile to be remotely controlled and to carry a warhead to deliver an electromagnetic pulse (EMP). Burly Jasmine watches for potential drone boarders. Gabriel scans the Kazador and finds particle-beam weaponry. The pilot also sets a retreat course back to Earth. Robot ARTHERR notes that the arachnid aliens may merely be intermediaries for someone else, who might be waiting at Luyten’s Star, a relatively close and potentially inhabitable system. Con artist Richmond instructs crewmembers Nero Bartholomew and Averki “Deep Dish” Dyashenko to rearrange the cargo bay. Hector asks Jasmine to pose as captain to continue negotiations with the Nolath, but the tiger Synth declines. The former spy recommends backing out of the deal, and Gabriel agrees. Richmond, who accepted the mission from fixer “Ramon Sanchez” [Josh H./Greg/N.P.C. ], sees no reason not to take payment of the remaining 20,000 credits (or NeoYen, kilocalories, or U.E.A. dollars). ARTHERR argues that turning over cultural artifacts to the Nolath may not be in humanity’s best interests. Capt. Adams tells Capt. Stroja that his manifest does not match the cargo, so there must be a mistaken identity. The Appomattox goes to faster-than-light (FTL) Transit before the Kazador can scan it again. During the week’s journey back to Earth, Hector considers diverting power from ship systems to improve the Appomattox‘s Ru’ulok (heavy-gravity reptilian alien) Transit drive beyond 1 ly per Terran day. Jasmine is disappointed at having to return to human space, and Gabriel wonders if his underworld contacts can help him find a proper recipient for the Vatican relics. ARTHERR suggests the United Earth Authority or the United Ecumenical Movement, while Richmond entertains the castaways from the Razorfeather shipwreck — Olvar (mammal-like arboreal extraterrestrials) Maj. Mohing Lankel, Lt. Doina Claren, and Mr. Kares Mussur, as well as Cestolar (badger-like) envoy Yiushef of Geruno. Hector and Jasmine warily watch the guests, since Yiushef warned that one is likely a saboteur. Gabriel asks his companions where in the Sol system they should go next…. Greg and Dave, we missed you at the last regular game of 2011! Weather permitting, Team 1 (the crew of the Blackbird) is scheduled for Monday, 9 January 2012. “Vortex” Team 2 will meet again on Jan. 16. Posted on December 22, 2011 by GeneD5Posted in Games, Speculative Fiction, VortexTagged appomattox, fate, RPGs, sfrpg, space opera, starblazer adventures, team 2. Fellow role-players, here are my notes for Session 5b.24 of the “Vortex” space opera campaign. Team 2 met on Monday, 28 November 2011, and is using FATE 3e Starblazer Adventures/Mindjammer, Bulldogs, Diaspora, and Limitless Horizons. >>”1 to 7 November 2194 A.D./C.E. or 0 Terran Galactic Era:” During its first extrasolar voyage, from Saturn’s moon Titan to Epsilon Eridani, the Appomattox had caught up with the Chengdu, a slower-than-light generation ship from Earth. Among other things, the away team had helped extricate injured Delphine (“Uplifted” dolphin) Bob from the Chengdu‘s systems. Capt. Gabriel Adams has another intimate dinner with bursar Ghia Shan before preparing the Appomattox for departure. Hector Chavez negotiates for antique tools and ordinance, and ARTHERR studies the colonists’ medical records and culture to eventually help fellow sentient robots Tanya and Galia. Jasmine meets another “Synth” named Isabella, who asks via voder about the habitability of planets near Epsilon Eridani. The tiger-woman tells the “Uplifted” orca that while one planet may have seas, it’s unlikely to be immediately hospitable to the Terran pilgrims, who have already spent a century traveling. Richmond Garrett finds the passengers of the “Chengdu” too pious for his tastes and recommends delivering the cargo of items from the Vatican Museums to its mysterious recipients as soon as possible. ARTHERR tries to entice the humans to explore with the possibility of diamonds or other natural resources. The Appomattox continues on its way to Epsilon Eridani, which is about 10 light-years from the Sol system. Jasmine is again uneasy in Transit space but recovers once the yacht emerges from faster-than-light travel. Gabriel pilots the Appomattox past asteroid belts and two gas giants. Hector notes the presence of buoys orbiting the star, which is slightly smaller than Earth’s sun. The humans and Synths ignore two rocky planets and head to Epsilon Eridani B, about 0.8 AU from the star. The planet is in the biozone and has seas, but the pH is too alkaline for Terrans. ARTHERR exits a launch bay and orbits independently to scan. The probe droid finds no signs of civilization, but the atmosphere has just enough oxygen and warmth to support life. Jasmine suits up and arms for the landing party, but Richmond prefers to stay aboard in comfort with crewmembers Nero Bartholomew, Averki “Deep Dish” Dyashenko, Tanya, and Galia. Gabriel finds some relatively level terrain to land the Appomattox. ARTHERR, who has built a magnetic slingshot for escaping planetary surfaces, happily wheels out and begins taking soil samples. Hector scans for communications, and Jasmine looks out for hostile life forms amid the algae-covered rocks. As a volcano smokes in the distance, the team finds a crashed starship. Gabriel boldly leaps into a hull breach but is stabbed twice by someone inside! Jasmine cautiously advances, poking her rifle and flashlight into the open compartment. Engineer Hector examines the wreckage and says that the vessel crashed relatively recently. ARTHERR compares the flying-wing design to databases and concludes that the ship is of Olvar (arboreal mammal-like alien) design. His vacuum suit leaking air, Capt. Adams sees a short, stocky humanoid brandishing a blade. The courier throws a grenade and jumps back out! ARTHERR patches Gabriel’s suit before he can be harmed more by the caustic atmosphere, and Jasmine pulls the battered alien, which has a cute, furry face, from the ship. ARTHERR identifies the badger-like alien as a Cestolar, a member of a client species of the Olvar. Yiushef of Geruno claims that the other survivors of the crash left him behind because he couldn’t keep up with their longer legs. Hector is concerned when the Cestolar says he believes that the Razorfeather was a victim of sabotage by one of its own crew. Yiushef reluctantly gives the newcomers a tour of the Razorfeather, which was returning from space controlled by the Gustrall (orange-furred, raptor-like warriors). Capt. Adams heads to the bridge, which contains bodies of the Olvar killed by the sabotage and crash, contrary to Yiushef’s initial claim of cannibalism. The Cestolar tells ARTHERR that he is a trade delegate and that several parties might want to hinder relations between the Olvar, who are part of the Kharvamid Alliance, and the mostly nonaligned Gustrall. Jasmine goes to the armory, where she picks up a few unidentified weapons. Deep Dish radios that another ship has entered the Epsilon Eridani system and is a few hours away. It is transmitting a numerical code. Gabriel and ARTHERR take Yiushef and the Appomattox to pick up three Olvar, who have set up a distress beacon on a steep slope near a cave several kilometers away. Hector restarts a microfusion generator to take a look at the crashed ship’s logs. The former spy salvages parts of the Razorfeather‘s engines and communications systems but is disappointed that he doesn’t have time to take more. The FTL drives in the Olvar ship’s broken wings are inoperable. Onetime wrestler Jasmine impresses the lithe Olvar castaways and asks for their weapons. The tiger-woman leads Maj. Mohing Lankel, Lt. Doina Claren, and Mr. Kares Mussur to guest cabins, along with Yiushef. Capt. Adams takes the “Appomattox” back into orbit, and Hector hails the incoming vessel. ARTHERR identifies it as belonging to the Nolath, an arachnoid telepathic species. Gabriel makes mental contact with Capt. Stroja of the trade ship Kazador. The spider-like Nolath transmits a cargo manifest that matches the Vatican relics. Gabriel and ARTHERR are initially more reluctant than Richmond to complete their delivery, which doesn’t seem to benefit humanity, but the courier sees his fears as a challenge, and the robot is curious about the deal that fixer “Ramon Sanchez” [Josh H./N.P.C.] had brokered. Hector detects an attempt to hack into the Appomatox‘s systems, so he and Jasmine hasten to the guest quarters to confiscate the radio from Mr. Mussur and threaten the mischievous Olvar and Cestolar with “spacing” if they violate hospitality and security again. Hector makes sure systems are locked down or on analog backup and activates surveillance for the possible saboteur. Stroja and several Nolath and other space-armored spiders of various sizes come aboard the Terran vessel. They ask to inspect the cargo, and Gabriel stalls, asking for time to double-check the manifest and consider the trade. Stroja agrees and returns to the Kazador while the command crew of the Appomattox searches for other ships in the area and discusses its next moves…. Thanks again to Beruk and all those who got me The Batman Files as an early Christmas gift! I hope that all your holidays are happy! The next “Vortex” game will be for Team 1, the crew of the Blackbird, on 12 December 2011. Posted on December 2, 2011 by GeneD5Posted in Games, Speculative Fiction, VortexTagged appomattox, bulldogs, fate, RPGs, sfrpg, space opera, starblazer adventures, team 2. Fellow role-players, here are my notes for Session 5b.22 of the “Vortex” space opera campaign. Team 2 met on Monday, 17 October 2011, and is using FATE 3e Starblazer Adventures/Mindjammer, Bulldogs, Diaspora, and Limitless Horizons. >>”19 to 21 October 2194 A.D./C.E. or 0 Terran Galactic Era:” While on its way to deliver a mysterious cargo of Vatican relics to Epsilon Eridani, the crew of the Appomattox became involved in a murder investigation on Eclipse Station, in orbit around Saturn’s moon Titan. Hector Chavez monitors news channels and hacks into the station’s security, and ARTHERR notes that LP 656-38, a star system near Epsilon Eridani, is somewhat more likely to have human-inhabitable planets. Jasmine meets with Kolidari, the octopoid (“Uplifted” octopus) co-owner of the Lucky Garden Casino. After reluctantly sharing a hot tub with him and Delphine (“Uplifted” dolphin) astrogator Erta Garza, the Felinoid says she’ll consider his offer to work with “Synths” rather than for humans who treat them poorly. Richmond Garrett orders a hovercycle in the form of a robotic horse from provisioners Amir and Hassan Mukhtadi. Back at the casino, Capt. Gabriel Adams continues chatting up gynoids Tanya and Galia in the hope that they’ll help him with a heist. Damp Jasmine returns to the space yacht, where she reports to Hector and company about Kolidari (whose voder makes him sound like archaic-era actor Sean Connery). Onetime spy Hector recalls that security cameras caught an octopoid near where firebrand preacher Hugh Doyle was found murdered. ARTHERR sees little reason to turn in the charismatic fellow Synth (synthetic sentient) to the local authorities, since Doyle had claimed that divine scripture “granted man dominion over all life.” Mr. Garrett agrees that it’s better to steer clear of the unsettling assassin, even if Gabriel still plans to rob his casino. A security alert warns Hector of another disturbance near Eclipse Station’s chapel. A woman is rallying Doyle’s followers to continue spreading his fundamentalist doctrine across the outer Sol system. The local constabulary — as well as gambler Rev. Winston Jones, in all likelihood — seems more concerned with protecting the casino than confronting the angry mob. Hector sets off an alarm in an attempt to disperse the assembled scruffy colonists and religious zealots. ARTHERR and Richmond get on the intercom and warn of “Venusian cancer gas” before local authorities cut them off. Since the woman continues inciting the colonists, Hector uses the fire-suppression systems to spray her with carbon dioxide foam. The communications expert later identifies her as Louise Reinhagen, the wealthy widow who was a financial supporter (and onetime lover) of Hugh Doyle. ARTHERR notes that a recording from the Ringtown Diner caught her talking with Adrian Valentin, a smuggler who bought the equipment used to kill Doyle. Reinhagen had revealed to Gabriel that Valentin was blackmailing her and Hugh at the time of his death. In a back alley, Jasmine again meets with Synth laborers “Prini Vonchadry” [Non-Player Character/Beruk], “Rosario Tamuz” [N.P.C./Greg], and cigar-chomping Chim (“Uplifted” chimpanzee) Faisal Batar. She warns them of Doyle’s followers, who may lash out at nonhumans in their grief at his unsolved murder. Ursoid (“Uplifted” bear) Prini relays the tiger-woman’s news about Reinhagen and Doyle’s relationship to the information networks, while Felinoid (“Uplifted” panther) reiterates her drunken theory that Doyle was sacrificed to “dark gods” — even though she is unaware of the ritualistic aspects of his murder. ARTHERR had theorized that the disembowelment and candles were an attempt at misdirection. After conducting research into Louise’s late husband Jurgen Reinhagen, an Oromax megacorp executive killed at the Hephaestus Stadium disaster near Venus, Richmond changes clothes and goes to meet her at a luxury apartment on the station. A robotic butler greets the confidence artist, who finds the merry widow strangely unaffected by the deaths of her husband and lover. Louise admits that Doyle was no friend to the United Ecumenical Movement (U.E.M. ), Rev. Jones, or Synths, but she found his beliefs comforting after her husband’s death. Reinhagen reiterates that Valentin had threatened to expose her relationship, which has now happened even after Doyle’s murder. Meanwhile, Jasmine and a small but feral group of Synths goes in search of Reinhagen as the current leader of Doyle’s flock. 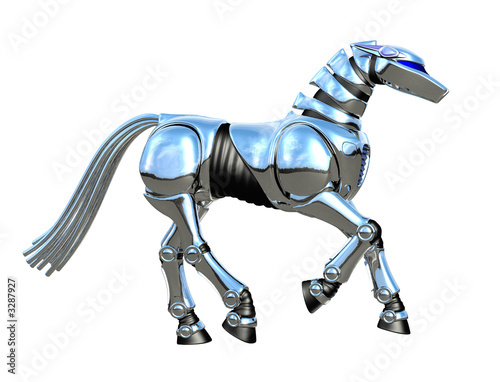 Hector spots them heading toward the residential area, and ARTHERR hastily assembles Mr. Garrett’s robotic horse (a non-Vimeco model). Richmond tells Louise to retreat through a rear exit and meet him later at the Appomattox‘s dock. He then goes to talk to the fierce bioengineered and robotic beings. Former wrestler Jasmine tosses the snake-oil salesman over her shoulder and sprints to get some breathing room. Engineer Hector shuts down airlocks so they can’t be spaced and tinkers with life support to slow down pursuit. ARTHERR broadcasts images of Richmond’s past altercations with Doyle’s followers to the corridors near the Synths to show that he’s actually on their side. The sheriff and counterdemonstrators will soon arrive, observes Hector. ARTHERR remotely — and not very gracefully — guides Richmond’s horse to him, crashing into a wall on the way. Mr. Garrett manages to calm the crowd and gets behind Jasmine in the saddle. They fly back to Eclipse Station’s docking bay. Capt. Garzan Cisneros of the local patrol warns the troubleshooters that since Richmond has been involved in several civil disturbances around Venus and Saturn, he should avoid future trouble on the station. Even though he plans to address Doyle and Reinhagen’s followers and has had complaints filed against him by the real Dr. Garrett, Richmond agrees. Synths Averki “Deep Dish” Dyashenko and Jasmine are reluctant to let Reinhagen aboard the Appomattox, but Richmond ushers her to an unused cabin, hoping to later tap her wealth and perhaps have her join his crew. ARTHERR attends to the damaged hovercycle, adding a pony-shaped sidecar. Archbishop Javier Fuentes radios Hector to inquire about progress in the investigation of Hugh Doyle’s murder. The armored U.E.M. officer says he has two troop transports of chaplains on its way from New Quebec to help secure the orbital station, but ARTHERR warns against provoking further violence among the Saturnian colonists. Hector reveals that a conspiracy suspect is in custody, and Archbishop Fuentes agrees to send a less obvious detachment for her once a confession is extracted. Burly Jasmine stands guard as Richmond reluctantly questions the widow. After flirting and weeping in vain, Louise explains that Adrian Valentin had been using Doyle’s expanding network of followers to facilitate his smuggling. When moralistic Doyle objected, Valentin blackmailed him and Reinhagen, ultimately carrying out his threat to kill him. Mr. Garrett asks Reinhagen who else would profit from Doyle’s death, and she eventually names Kolidari and Esteban Bakafret, a shipping magnate whose profits might be threatened by the self-righteous preacher. She knows nothing of the ritualistic aspects of the slaying. In return for a “donation” to “MarSoupAil” — shell company Mars Soup Aid Lenders Ltd. — the grifters offer to minimize their description of Louise’s involvement (not to mention the octopoid assassin) to the U.E.M. to protect her from reprisals by Bakafret. They then turn her over to Archbishop Fuentes’ agents, who say they’ll work with Capt. Cisneros to find Valentin and close the inquiry. Now that the U.E.M. owes the Appomattox a favor, Hector contacts his onetime handler Max back on Earth to help cover his tracks and check the news. Richmond retreats to his well-appointed quarters and calls for chef Nero Bartholomew. Jasmine wonders whether Erta, Tanya, and Galia will be able to join the crew without her going back to Kolidari. Gabriel still wants to rob the casino and learn more about the Vatican artifacts. ARTHERR sets a course for Epsilon Eridani…. Thanks again to both “Vortex” groups for replenishing our munchies! Paul, we missed you, and note that the Pathfinder/Skype: “the Vanished Lands” fantasy telecom team won’t be playing again this coming weekend. Thanks, Greg, for your flexibility regarding your Dresden Files game as I sort out my schedule for November. Posted on October 19, 2011 by GeneD5Posted in Games, Speculative Fiction, VortexTagged appomattox, leverage, rpg, sfrpg, space opera, team 2.